As 125 Sacramento-area young professionals worked together to solve trivia questions over beers at Yolo Brewing Company, they also exceeded their goal of raising $3,000 to increase access to healthy drinking water at Sacramento elementary schools. United Way’s recent Young Leaders Society Brews & Brains event raised more than $4,000 toward the group’s Hydration Station Initiative, which will fund the purchase and installation of hydration stations in target schools, provide every student at the school with a reusable water bottle, and educate students on the importance of drinking water and using water resources wisely during the California drought. 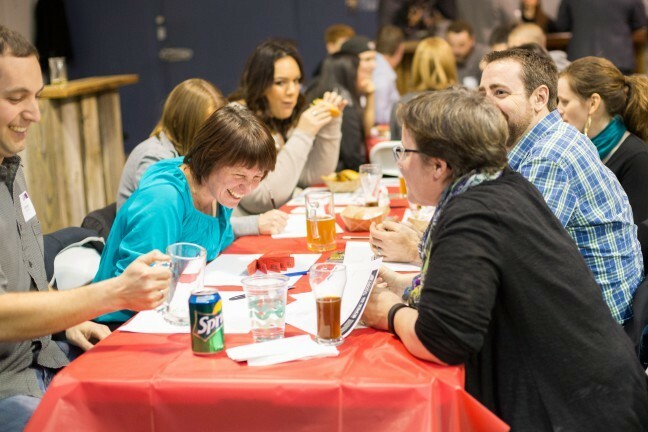 “There was so much energy in the room as we enjoyed solving trivia questions, drinking beer and eating from Fuzion Eatz food truck – all while raising substantial funding to make sure kids in our area have access to drinking water throughout their day,” said Dustin Humes, chair, United Way’s Young Leaders Society. Thirty-two percent of youth in the region are overweight or obese so United Way California Capital Region and its partners are working to reduce the number of overweight people in the region by 20 percent. To assist in reaching this goal, United Way’s Young Leaders Society is focusing on ensuring students have access to water as a healthy beverage, and education about why water is such a valuable resource to protect. The group’s goal is to raise $25,000 for the project in 2015. To make a donation or to join United Way’s Young Leaders Society, visit www.yourlocalunitedway.org/young-leaders-society. United Way’s Young Leaders Society is a diverse group of young professionals ages 21-40 that is focused on philanthropy and service in the greater Sacramento region. Members are committed to investing in health and education opportunities for students by volunteering their time, mobilizing social networks and raising money for a specific community impact project. For more than 90 years, United Way California Capital Region has brought together nonprofits, businesses, donors, volunteers, community leaders and more to meet the community’s greatest needs, give immediate aid and find lasting solutions for future generations. United Way mobilizes members of the community to be first responders in repairing the education level, financial stability and health of everyone in Amador, El Dorado, Placer, Sacramento and Yolo counties through donation and volunteer opportunities. To donate or volunteer, visit www.yourlocalunitedway.org.